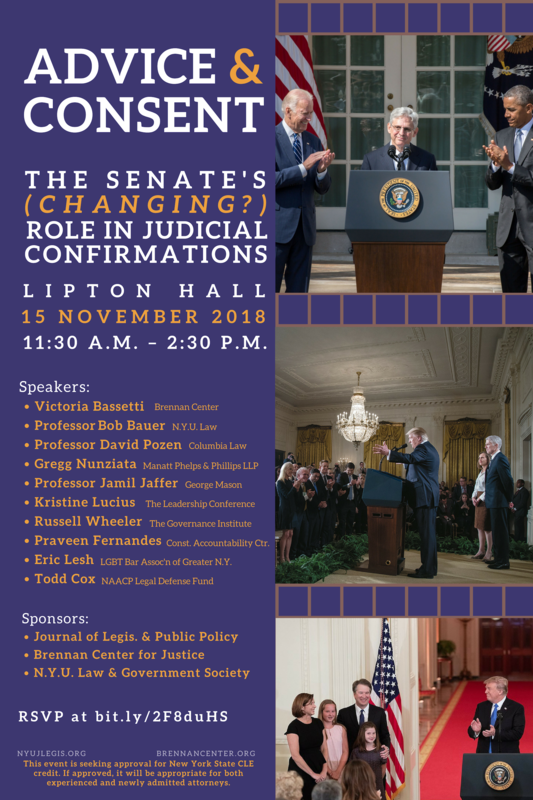 The NYU Journal of Legislation and Public Policy and the Brennan Center for Justice invite you to a symposium about the changing role of Senate “advice and consent” in the federal judicial nomination process. Changes in procedural devices, cultural norms, and Senate composition have led to President Trump’s appointment of more appeals court judges (by this point in his term) than any other recent president. They have also led to the extraordinary hearings surrounding the nomination of Judge Brett Kavanaugh to the Supreme Court. The symposium will examine the ways in which the past few years of judicial advice and consent differs from “business as usual,” what advice and consent should mean in the current political and cultural climate, and what institutional changes we might want to see in the Senate going forward. Application for CLE credit pending. Todd Cox, Director of Policy, NAACP Legal Defense and Educational Fund, Inc.